December 6, 2018 at 11:40a.m. Photo by Special to The Vindicator | Austintown detectives are seeking more information on the suspect in a Wednesday bank robbery. 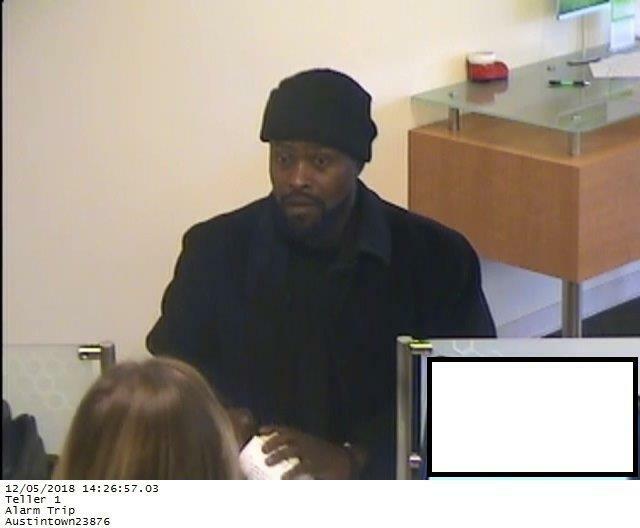 Township detectives are seeking more information on the suspect in a Wednesday bank robbery. The suspect slipped a note reading "This is a robbery. I have a gun" to a teller at the Huntington Bank along Mahoning Avenue at about 2:30 p.m. Wednesday, according to a township police report. He’s described as a black male standing 5-foot-10, weighing about 180 pounds, with a medium build. He was wearing dark clothing, including a black coat and what appeared to be black leather boots, police said. The teller reportedly emptied her till and the suspect fled on foot. A Huntington employee reportedly recognized the man and detectives obtained his Ohio Bureau of Motor Vehicles image. Anyone with information on the identity of the suspect or the robbery is urged to call Yacovone at (330) 270-5109 or the department’s tip line at (330) 270-5108. December 12, 2018 12:02 a.m.
March 18, 2019 10:55 p.m.